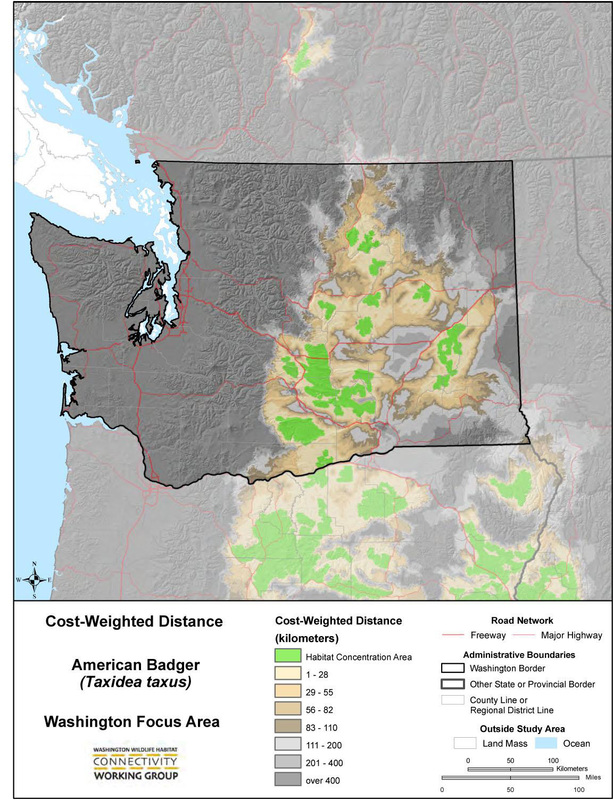 Cost-Weighted Distance Map – American Badger. Click for larger. At the statewide scale, we are looking for patterns of habitat distribution that dominate large landscapes. This can be thought of as a view of the land from 50,000 feet above the Earth’s surface. This view is interpreted through the behaviors and natural histories of some of Washington’s more mobile vertebrate wildlife, using computer models and our best understanding of what influences these species in their movement choices and the ways in which landscape features contribute to their survival and well-being. At this scale, we have analyzed the landscape with two approaches: a functional focal species approach and a structural landscape integrity approach. The statewide analysis is a first-step toward identifying regionally important areas using relatively coarse-scale data. The analysis also helps to prioritize areas that need additional attention to address important habitat connectivity concerns at a more localized ecoregional scale, using finer-resolution data and field assessment approaches. This statewide work was done with support from 444S Foundation, Great Northern Landscape Conservation Cooperative, Northwest Wildlife Conservation Initiative (supported by the Doris Duke Foundation), TransWild Alliance, United States Fish and Wildlife Service (State Wildlife Grants), Wilburforce Foundation, and Wildlife Conservation Society’s Wildlife Action Opportunities Fund. All files in .pdf format. 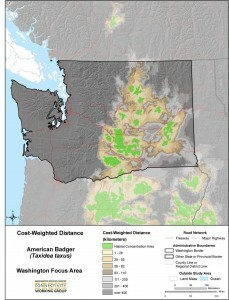 Washington Statewide Habitat Connectivity Analysis. Full document is a large download, see below for individual chapter files. Four main GIS datasets will be available to the public as a result of our statewide analysis: Base Layers, Landscape Integrity, Guilds, and Focal Species. If you have any questions in regards to data layers please visit our contact us page. List of all data layers currently available. This excel spreadsheet lists all data layers available for download below. All data layers are packaged into zip files for download. The Washington Wildlife Habitat Connectivity Working Group (WHCWG) produced these data which represent a regional analysis that portrays conditions at a regional scale. Applying these data at finer, more local scales is likely to increase uncertainty in terms of accuracy and applicability for local land use decisions. However, for the scale at which they were developed, these products are state-of-the-art, peer-reviewed representations of landscape variables and connected habitat networks. Despite this, the WHCWG makes no guarantee concerning the content, accuracy, completeness, or the results obtained from queries or use of WHCWG data, other than those for which the data was developed and its intended use. The WHCWG shall not be held liable for improper or incorrect use of the data described and/or contained herein. The WHCWG model input data were obtained from a wide range of state and federal jurisdictions in the USA, as well as from Canadian federal and provincial levels of government. The WHCWG expended great effort to compile the best GIS data within constraints imposed by data development costs, available compilation sources, and available staff resources. Inherent in any data set used to develop graphical representations, are limitations of accuracy as determined by, among others, the source, scale and resolution of the data. The products and data from this statewide analysis convey a wealth of information relevant to conservation of Washington’s wildlife and though they represent the state of the art, they rely on imperfect data, knowledge, and assumptions. We strongly suggest that readers thoroughly understand our methods and the limitations of those methods prior to applying our results. The data user should note Chapters 2 and 4 and appendices in the WHCWG December 2010 final report for further details.